Its a little different than its competitors as it sports a display with a 4:3 aspect ratio. This aspect ratio is more square-like (read more iPad-like) which is meant to provide a better web browsing experience. 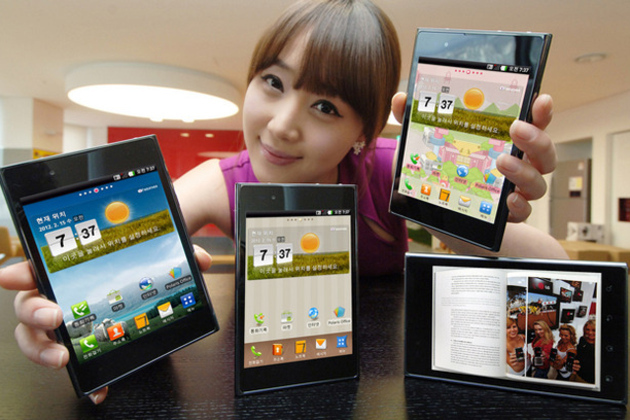 The LG Intuition also comes with a 5 inch HD display, 1.5ghz Snapdragon s4 processor, 1gb of ram, LTE, front/rear facing cameras, Android 4.0 Ice Cream Sandwich, and a stylus. It also has builtin NFC for mobile payments and other futuristic wireless fun. Something very unheard of though is the fact that the LG Intuition comes with two writable NFC tags which you can program to trigger certain actions on the device. You could set one to turn off wifi and enable wireless tethering when you get in the car or silence the ringer when you get to work or bed. Pretty exciting to see a big company like LG getting the public familiar with more NFC use cases. See the press release from LG below. BASKING RIDGE and ENGLEWOOD CLIFFS, N.J. – Verizon Wireless and LG Electronics USA today announced the Intuition by LG, a next-generation device that offers the full functionality of a smartphone and a tablet all in one slim, pocket friendly device. The Intuition by LG, exclusively for Verizon Wireless, will be available online at www.verizonwireless.com starting Sept. 6 and will be in Verizon Wireless Communications Stores beginning Sept. 10 for $199.99 with a new two-year customer agreement. The Intuition’s innovative design and features let customers record their most creative ideas while also staying productive, all in one device. Customers will also have access to the Verizon Wireless 4G LTE network, which covers more than 75 percent of the U.S. population and will soon be available in more than 400 markets nationwide. LG’s 5-inch display with high-definition detail gives customers a premium viewing experience with exceptionally sharp detail, and the 4:3 aspect ratio makes it ideal for reading e-books, watching videos, Web browsing and reviewing presentations. The Intuition features the Polaris® Office app, allowing customers to view, create, edit and share documents, spreadsheets and presentations right on the Intuition’s large display and can even organize files by category or folder. The QuickMemo™ app can be used with a single press of a button and allows customers to draw or write messages with the included Rubberdium™ pen or with their finger on just about any screen. Add a personalized handwritten note to pictures, maps, websites and easily share with friends through text messages, social media, email and more. Customers can even pick different colors and pen types to help further customize their notes. The Intuition also features the LG Tag+ app and two reprogrammable NFC (Near Field Communications) stickers that can be used to create and switch between different phone modes with a single tap. For example, the stickers can be posted onto an office door or bedroom nightstand and customers simply tap the NFC sticker with their phone to activate a mode and tap it again to return to their original settings. The different modes are customizable and include Car Mode, Office Mode, Sleep Mode and User Mode. Settings like Bluetooth®, GPS, Wi-Fi and more can be turned on or off by tapping the back of the Intuition on an LG Tag+ sticker. · Enhanced camera features include voice commands to take a picture, continuous shot to take 6 shots with one tap and panorama shot to merge horizontal shots. · Intuition by LG will be available online at www.verizonwireless.com starting Sept. 6 and will be in Verizon Wireless Communications Stores starting Sept. 10 for $199.99 with a new two-year customer agreement.